Responsive Website– Having a website with good responsive design is a must for today’s business owner. 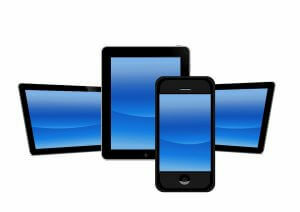 A responsive UI (user interface) is adaptable to the size of virtually every screen it is seen on, whether it is a laptop computer, desktop computer, smartphone or tablet. Responsive design software allows the website to adapt to the size, number of pixels and orientation of the screen so customers are able to view the layout of the page as intended, regardless of the type of device it’s being viewed on. Additionally, the platform on which the device runs is recognized by responsive design software, allowing the image to adjust accordingly for different devices so everyone can see your website in all its glory, regardless of whether they are on an iOS or Android platform. Mobile-Friendly Website– When a website is optimized for mobile device usage without cutting out any of the pertinent parts of the original website, it is referred to as “mobile-friendly.” Not long ago, a change in Google Analytics algorithms began severely punishing websites without mobile-friendly pages by decreasing their rankings. It may seem harsh, but it is necessary, considering that as of 2014, mobile devices overtook desktop and laptop computers as the primary device people use to access the internet. In other words, if your website isn’t mobile-friendly, it will not get the page views or rankings it needs to push your business to the next level. Mobile-Only Website– At first glance, a mobile website may look the same as a mobile-friendly website, but there is one huge difference: a mobile-only website cannot be viewed by a desktop or laptop computer. Having a separate website only for mobile device users is counterintuitive, as it drives down your overall ranking by appearing as two websites with identical content. It is absolutely best practice to have only one website for your company. The Takeaway– When planning your web design, it’s best to include responsive web design and mobile-friendly capabilities. This will get you the most out of your website, enhance your page visitors’ overall user experience, and make your website viewable and accessible for all who wish to visit.